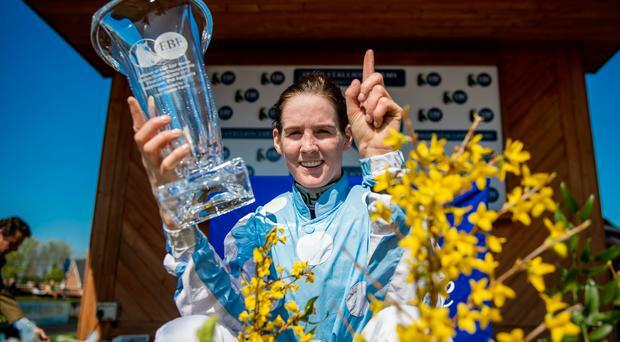 It was a day for the history books as the Fairyhouse Easter Festival kicked off at the Co Meath course today, as Rachael Blackmore won her first Grade One race on Irish soil. As many as 25,000 racegoers are expected to descend onto Fairyhouse racecourse this Easter weekend. It was another historic day in Gordon Elliott's training career as General Principle (20/1) secured his first Irish Grand National in dramatic style, but it ended on a sour note for winning rider JJ Slevin. Al Boum Photo hit top gear late on to deny Shattered Love in the Ryanair Gold Cup Novice Chase at Fairyhouse yesterday. It's astonishing to think that, for all the accolades Willie Mullins and Gordon Elliott have to show on their remarkable training CVs, the Boylesports Irish Grand National remains elusive. Willie Mullins has confirmed that Footpad is set for a trip to Aintree after being taken out of Sunday's Ryanair Gold Cup at Fairyhouse. This year, Carton House's Most Stylish Lady competition takes place on Easter Monday and the theme is 'Modern Vintage', inspired by the earls and ladies who both inhabited and visited Carton House over the centuries. Sky Sports News presenter Olivia Wayne will judge the competition this year. Wherever the history of National Hunt racing is written, it is layered in the green and gold of Meath. Doctor Phoenix produced a career-best performance to win the Bar One Racing Dan Moore Memorial Handicap Chase at Fairyhouse. Fayonagh is the star of the Fairyhouse cast today, one of four really good rides for Davy Russell. The third day of the Fairyhouse National meeting is a bit like the night after the wedding, the refuge of family members and those who don't want the party to quite stop. Easter bonnets and last-minute tumbles kept crowds entertained at Fairyhouse Easter Festival. Road To Respect capitalised on Yorkhill's eccentricity to win a dramatic race for the Ryanair Gold Cup Novice Chase at Fairyhouse. The horses dispersed after David Wachman retired have generally been running with credit and Love Potion, which has joined Aidan O'Brien, is taken to show her class in Cork's feature Noblesse Stakes today. My woeful record in Grand Nationals continued last week and, unfortunately, I can still say that I haven't backed the winner since I had 50 pence on Mr Frisk at 16/1 aged ten back in 1990. The Irish Grand National is now the biggest race on the Irish National Hunt calendar and it's getting even bigger. Robbie Power was in a room of the Mater Hospital last October, not a soul in the building likely to have known who he was, when he started to cry. Former English Grand National third Seabass has died, trainer Ted Walsh paying tribute to "an old friend". The richest jumps race in Ireland takes place in Fairyhouse on Monday. Ante-post favourite Our Duke is one 74 horses still in contention for the BoyleSports Irish Grand National at Fairyhouse. Trainers' Association chief Michael Grassick says a meeting will be arranged with the Irish Jockeys Association to discuss their concerns over how the controversial Rule 212 is playing out.